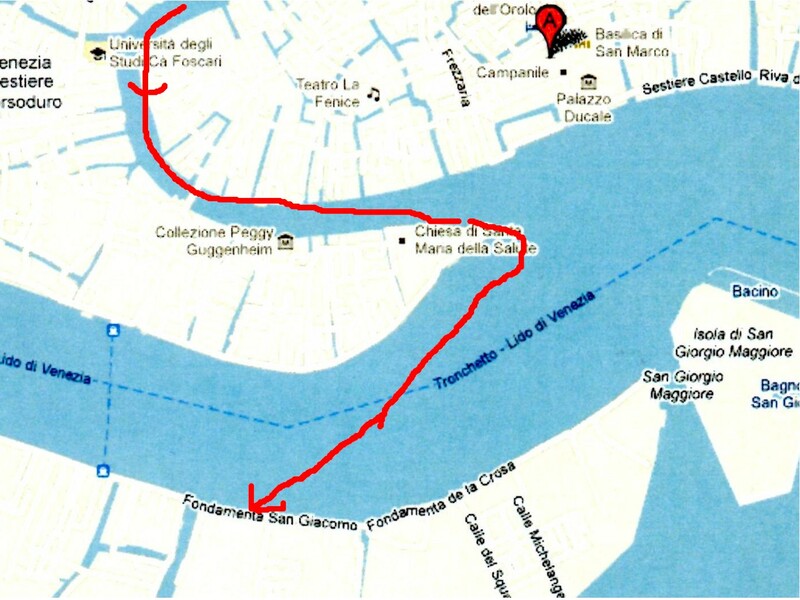 We slept a little later this morning and then walk down to San Marco ( see "B" on the map). W e were able to go right in, no waiting lines and no one hurrying us through. 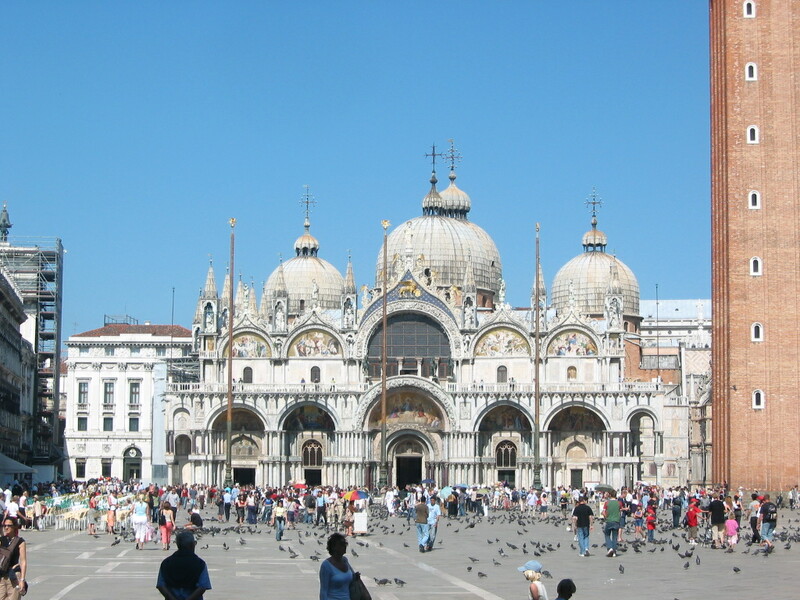 St. Mark’s was built in1063 (same as Pisa). 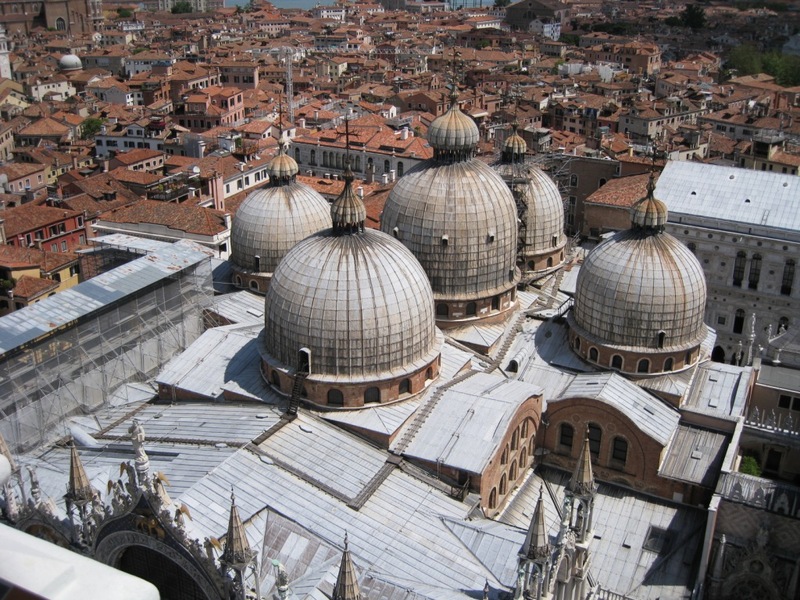 St. Mark’s was the private church of Doges and technically not cathedral. It is a duplicate of Apostles church in Constantinople. It is a Byzantine cruciform church - Greek cross with five domes. We were able to do a few extras – the treasury and Palla Doro. The first time that we were here on the tour, we were rushed through. Even when we went back on our own it seems we more made to move quickly. No pictures are allowed. Then we went upstairs to the museum where they had the original four horses that were brought back from Constantinople on display. 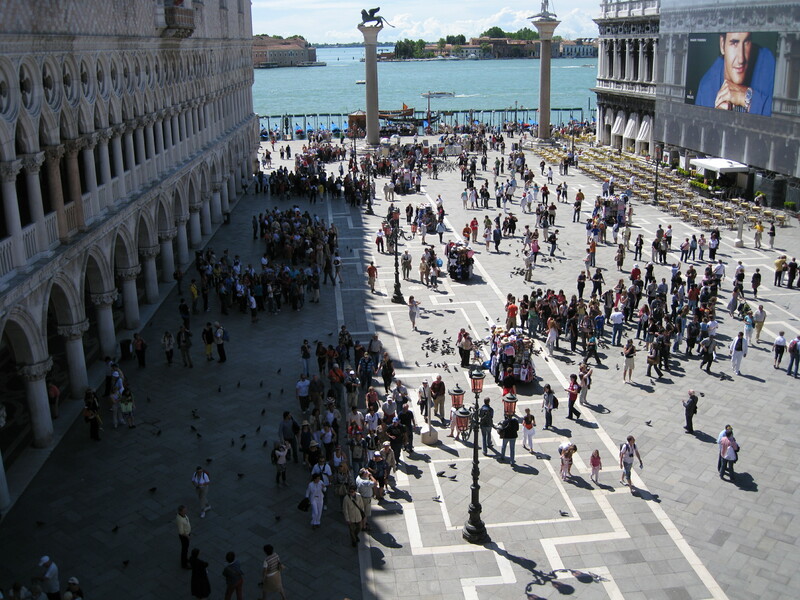 We were able to go out on the balcony where we had an excellent view of San Marco Square and a close up of the mosaics on th e façade of the cathedral. As we approach the bell tower, we saw a short line, so I decided to go up. My wife didn’t want to go. It wasn’t a very long wait. It was a beautiful day and you could see for miles. I took a lot of pictures. 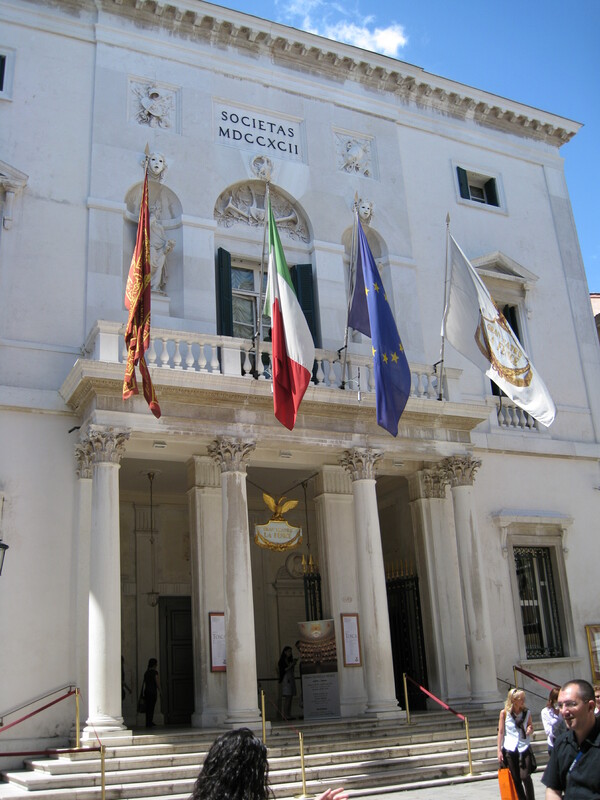 From there we went to the La Fenice Opera House. Opening night was the next day so it was closed to tours because of a rehearsal. Ordinarily you can go in for a tour. We were disappointed that we couldn’t see it. For lunch we found a nice outdoor café, Haigs Bar. I had a delicious calf’s liver dinner and my wife had tomato with buffalo mozzarella cheese Caprice salad with the most amazing olive oil that she had ever tasted. Across the street from our table was St. Maria del Giglio church (see "P" on the map). Di Giglio means the lily. 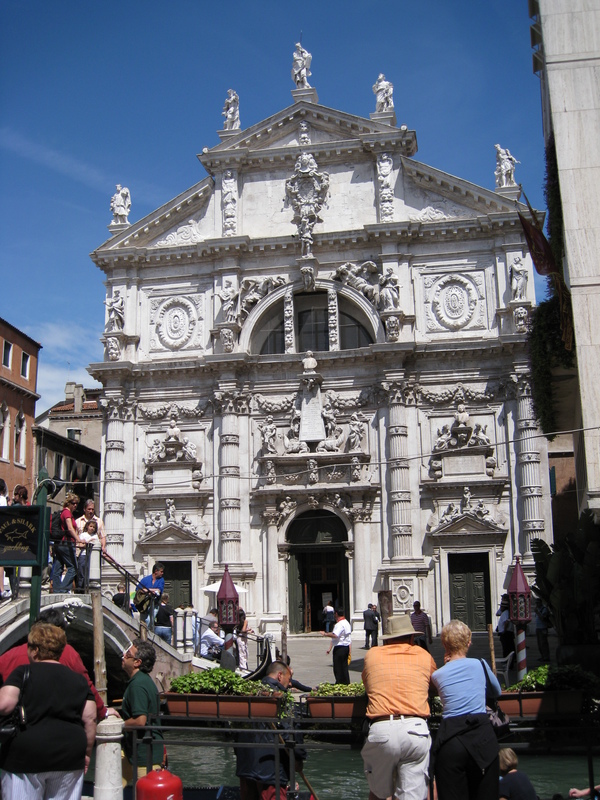 It had an exuberant baroque facade financed by the Barbaro family. The statues were of the Doges and their military conquests. The entire church was used to glorify their naval and diplomatic achievements. Inside there was a Rubens and two Tintorettos. Going back a few blocks was St. Mosie Church (see "N" on the map). It was 8th century church rebuilt in 10th century by Moise Venier. 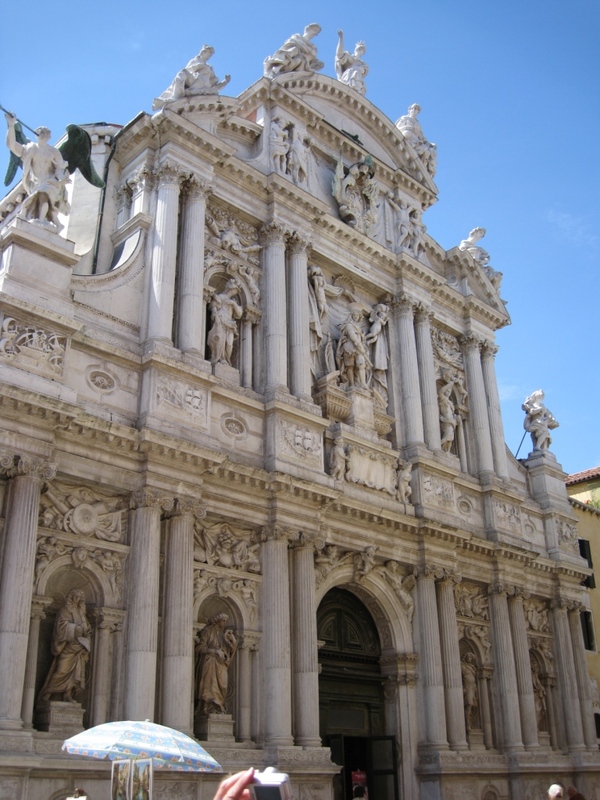 The Baroque façade, which was covered with grimy statues, sways and busts, was added in the 17th century. Someone had written that it was a “Pompous monument to the glory of the donor and family”. The interior was one big room with no aisles. It was not very impressive. 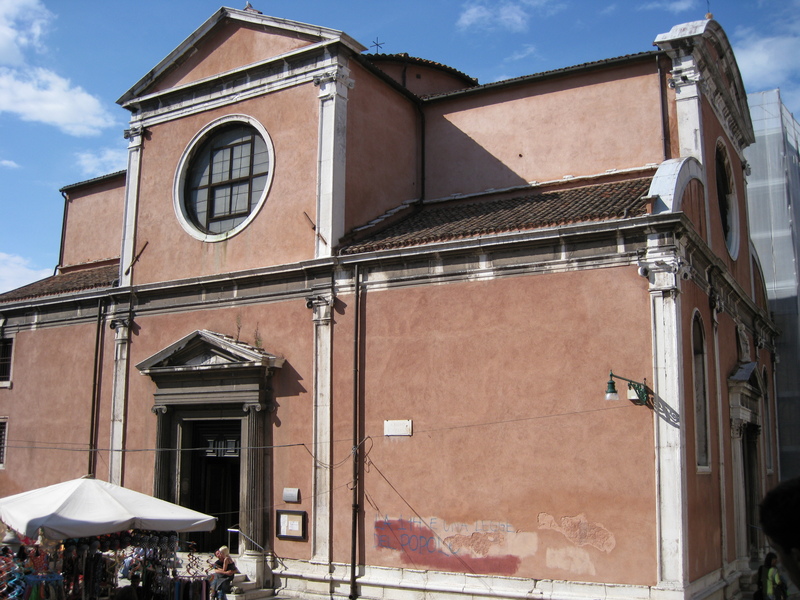 Our next stop was a beautiful Baroque church, San Stefano (see "F" on the map). It was started in the 14th century and altered in the 15th century. It had a wonderful ship's keel ceiling. All arou nd the side walls were altars with beautiful paintings above them. 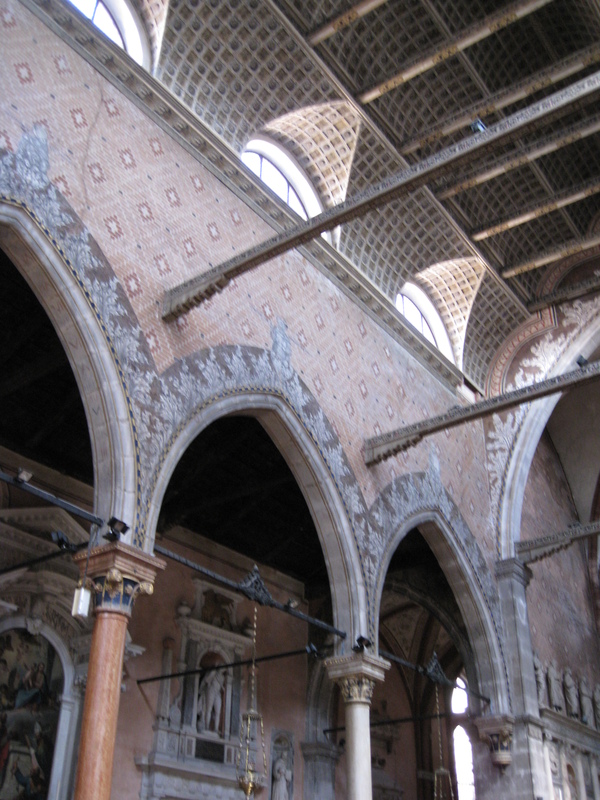 The beams were carved and the interior wall of the nave were brick arranged in geometric designs. One of the paintings was a Tintoretto. My wife was feeling tired so we found a vaporetto stop and went home. I went out in search of a few gifts. We had passed a number of times a little church, Santa Felice (see "A" on the map) which was next door to the grocery store. I decided to explore it and found the inside quite lovely. All I could find out about it was that built in the 10th century and restored in the 15th century. Next, I found a sidewalk café and had a good bourbon and water. 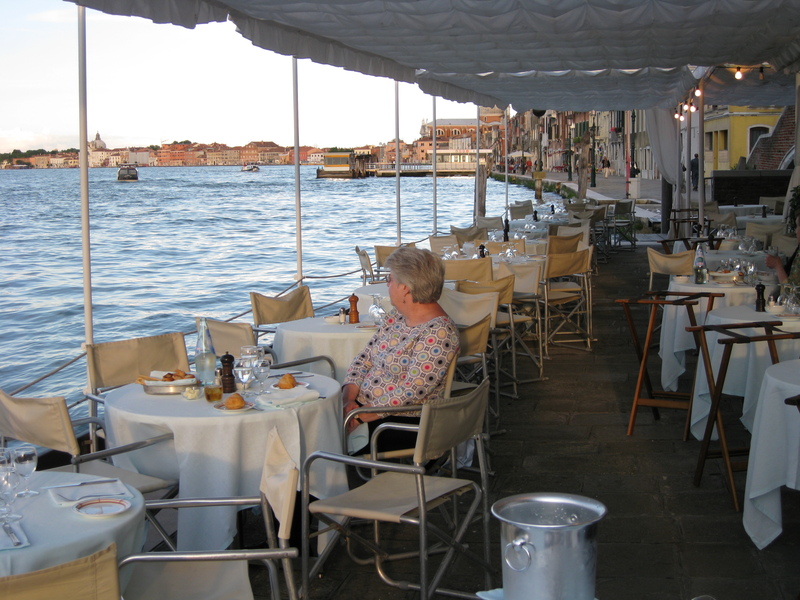 After my wife’s nap we took two separate vaporettos to the restaurant Harry’s Dolci on Guidecca . It is part of the Harry’s Bar and Cipraini chain. We had made reservations before we left home. We sat on terrace right by the water. Today’s weather had been anot her beautiful day like yesterday with blue skies and fluffy clouds. 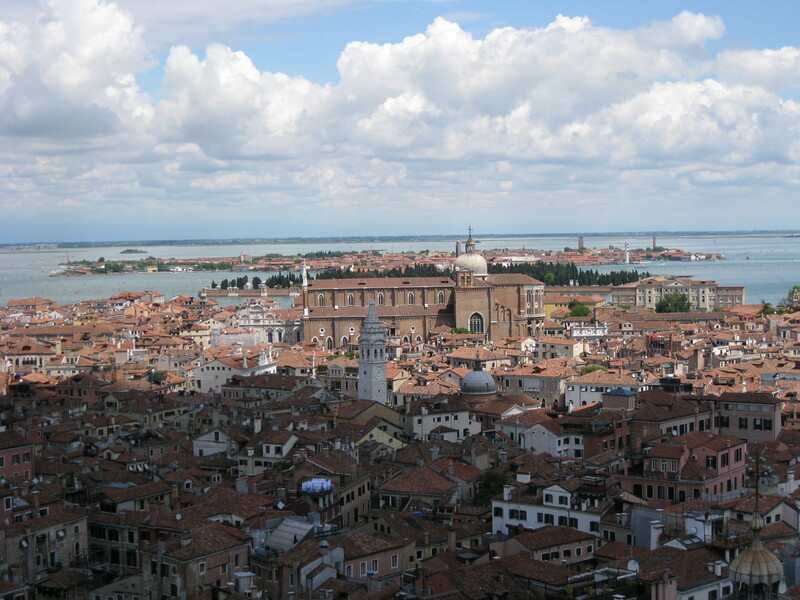 We had a wonderful view of Venice. The dinner was excellent and expensive. We began by sharing a risotto and cuddle fish –black risotto. My wife had a halibut, and I had a shrimp and calamari dinner. We had dessert, and they gave us a dessert wine. 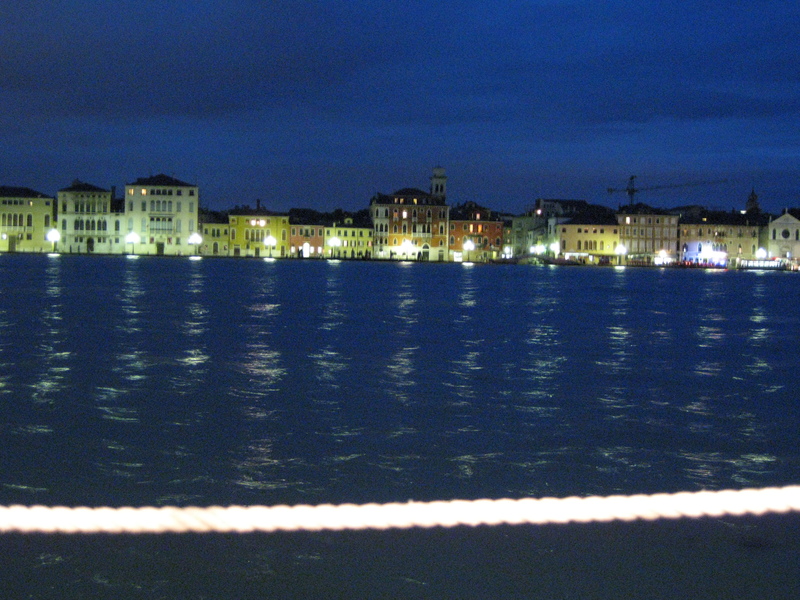 We got the vaporetto back to San Marco Square and walked around. We stopped in the Hotel Danieli for a drink. It had a beautiful lobby. On the vaporetto back home we met a young couple from Oregon. We didn’t get home until midnight.